When is it okay to use your emergency fund? Aaron started a load of laundry last night. As soon as the spin cycle started we heard a loud bang and a lot of really weird noises. I had known our washing machine was on its last leg. To be honest, I was secretly hoping it would finally die so that I could get a new dryer. My current one has a fun little quirk – it doesn’t like to start. My dryer takes 20-30 tries to start – it is the most annoying thing in the world. However, once the dryer started it worked fine, so I couldn’t rationalize such a large purchase for a little quirk. However, a dead washing machine is completely unacceptable (talk about a first world problem). So last night we hopped online, did a bunch of research, then visited a few stores. We came home with a new laundry set and the new dishwasher I had been eyeing for a while. We spent $2,300 in one evening. I don’t feel guilty at all. We did our research, got good deals and most importantly had the cash on hand. It is a great feeling to be able to make a large purchase without financing it, feeling guilty or wondering where the money is going to come from. Was this a good use of our emergency fund? Don’t you hate ambiguous answers like this? In my opinion, the emergency fund covered the washing machine, but not the dryer and most definitely not the dishwasher. Again, this is a first world issue, but with five people in the home, two of whom are under the age of 3, having a washing machine is a necessity. My dryer was quirky but it still worked and even though I hate my dishwasher it worked fine. So in this case, I pulled money from our emergency fund to cover the washing machine. The dryer and the dishwasher cost will be coming out of our cash flow and secondary slush fund. If you get in the habit of pulling from your emergency fund for every life event that happens, you’ll quickly find you don’t have an emergency fund anymore. There will always be some type of emergency in your life. When Should You Use Your Emergency Fund? Using your emergency funds can be a tough decision. People tend to either use it all the time and treat it as a savings account. Or they are so frugal they won’t use it even if they have an emergency. Neither use of the emergency fund is correct. A few years ago I began using the following questions to determine if I should be using my emergency fund. 1. Is this a true emergency? If I don’t spend this money will my family have a potentially adverse reaction? True emergencies are usually tied to home repairs, car repairs, medical expenses and other unforeseen costs that cause financial stress. 2. Was this something I should have been budgeting for? This was my downfall for years. I would always run into trouble with the annual expenses like car registration, insurance, and property taxes. I would also forget to account for semi-regular maintenance like tires and other general auto repairs that I knew would pop up eventually. To be honest, even my washing machine kind of falls into this category. My units were over 10 years old, it was just a matter of time until one of them broke. If I’m completely honest, the washing machine really isn’t a true emergency since I knew it was dying. 3. Could I have prevented this emergency through proactive maintenance? Most proactive maintenance in tied to vehicles and homes. Obviously, accidents happen, but I’ve found that when I do proactive maintenance on my large dollar items they last significantly longer. This is a tough one, I spend a couple hundred dollars each year having my A/C units inspected. I live in Phoenix and after having my unit die once in July, I’m a bit paranoid. I have no guarantees that the extra maintenance will prevent future issues but believe it is worth the time and money it takes. If possible, you should always be doing proactive maintenance. Most of the time it will save you thousands of dollars in car and home repairs. Editors Note: A few months after I wrote this post our A/C unit died. I was very, thankful for an emergency fund. Not only because we could pay for a replacement A/C unit, but also because our emergency fund saved us $1,500. 4. Can I repair or make do without the product for a while until I can save to pay cash? Often when something breaks it is a huge crisis and our immediate response is to replace it. Obviously, there are certain things that must be replaced, but I think in many situations a simple repair would work. If a repair isn’t an option most people immediately decide to finance their purchases. I know how tempting this can be, but you’ll never get out of debt if financing is your first option. It is okay to do without a product while saving up to purchase it in cash. I have the cash to pay for our new appliances but would have gone without few a few months rather than finance a new washing machine. Getting into debt for something like a washing machine just doesn’t make sense to me. I checked on repairs and it cost $100 to have someone come and look at my washing machine. From there the cost just goes up and that is if they can repair it. I may have gotten lucky and had a simple issue, but at 10+ years the washing machine was most likely toast. In this case, I’d rather not gamble and used the $100 towards a new unit. Obviously, the answers to these questions are going to be different based on your current emergency and your own financial situation. Unfortunately, I think a lot of emergencies are just poor planning. They are things that end up blowing up because we weren’t prepared or made poor decisions to reach a certain point. On the other hand, sometimes real emergencies happen and we have to dig into our emergency fund. I know that my emergencies are different than other people’s emergencies and don’t want to be judgmental or hard on people. This post is just as much for me as for anyone else. I need to be more accountable to myself on how I use my emergency fund. Once you have an emergency fund it is super easy to allocate a little bit of money towards things that really shouldn’t fall into the emergency category. In the past, I’ve used my emergency fund for a lot of really stupid stuff, which includes vehicle payments, credit card payments, toys, business ventures and a bunch of other junk. I do replace the money, I’m really good at always having at least 3-6 months in my fund, but I’m not good at using it for true emergencies. One of my goals this year is to only touch my emergency fund for true emergencies. I’m always going to be tempted to dip into my emergency fund for instant gratification. But as I learn to make wise financial decisions, this is one habit I intend to break. The trick is to learn to manage your finances so that you decrease your chances of having emergencies. 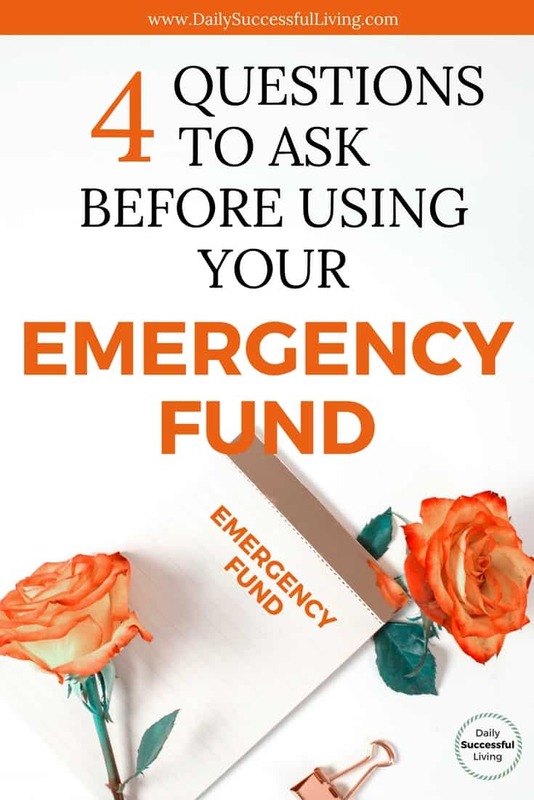 As you decrease your emergencies and get used to having a fully funded emergency fund, I believe that your need for non-emergency emergencies will decrease. Hi Amy! I had a similar situation this fall. My dryer broke(as in the repair man said it could never be fixed) after 10 years of service. I’ve had a repair man fix it more than once, and each time they’ve told me that 10 years is really beyond the life expectancy of any appliance of this century, so I wasn’t too surprised when I was told it was kaput. I bought a used dryer for $30 from the classifieds to try and stem the problem, but it went out after just a month of use. My washing machine was also 10 plus years old and I knew it could go any day as well. My big problem came when I was also in a car accident at the same time as all this, that totaled my car. (Luckily, not my fault, and I did receive a check from the insurance of other driver, but that didn’t exactly cover the new vehicle). In the end we ended up buying a new washer/dryer unit on a Christmas sale. They are very basic models, and the two together cost less than just the washing machine of the set I had been eyeing. In the mean time the set I did get is a large capacity and does the job. I was able to save my money and put it towards my new car (a 9 passenger suburban, which is handy for a family of 7 to be able to take along extra friends on occasion) which, luckily, I had also been saving for for several years, and was able to purchase with cash as well. All in all, I am still debt free and able to pay my bills without too much worry. But it is a little disheartening to see my long earned savings depleted so quickly-even if that was the very purpose of the accounts. It’s time to build up those savings accounts again! Wow, that is definitely worse than my story. I’m so glad it all worked out. I didn’t know you guys were living debt free too! Isn’t it the best feeling in the world. On a side note, we ended up going with fairly basic models as well. I did a ton of research and it sounded like the more bells and whistles the machines had the quicker they die. I don’t need a separate mode for jeans, towels, bedding and all that junk. I like to follow the KISS method when it comes to laundry – Keep it Simple Stupid.